Soloway Designs is an Arizona-based, award-winning Architecture firm serving residential and commercial clients all over the world. We strive to be different! Many firms design residences; we envision homes. Marc Soloway (AIA), Architect and Founder, emphasizes: “A home is a place that speaks your language, expresses your desires, and reveals that you are excited to be living in the place of your dreams.” Marc is a practical visionary, who creates uniquely dynamic homes that blend client wants and needs while amplifying and integrating the building-site panorama, and providing personal attention throughout the entire process. To begin the realization process for your new home, contact Marc at 520-219-6302, or marcs@soloway-designs.com. In Place Architecture is a full service Architectural Firm. Historic, Custom, Semi-Custom homes, Remodels, Additions, Yard, Pool, Spa, and Landscaping design. Experience with homes in Stone Canyon, Ventana Canyon Mountain Estates, Pima Canyon, Dove Mountain, La Reserve, Catalina Foothills 10. Contact us today at: 520-404-2166 We also have the with the full capacity to perform residential and commercial architect-led design-build projects with our Sister company Boen Signature Construction Services (ROC 312258). Raymond Ybarra attended the University of Arizona, College of Architecture and has over thirty years experience with a wide range of projects in Commercial and Residential. After years of gaining experience in the supporting staff roll as Project Manager, Construction Administration and producing Construction Documents for large successful Architect firms the decision was made to build a new start and Signature Design Studio was created with the focus on Residential Design. SDS has provided quality residential design services for various clients needs: - custom homes - historical renovation - additions and remodels - duplexes - student housing - GREEN alternative designs - construction administration - site development Design Services provided vary since each project is different and SDS is associated with quality consultants, engineers and builders. As a team clients will receive services that will meet building codes, cost effective construction methods and complete attention from start to completion. Projects are in all shapes and sizes and with the growing need for eco-friendly concepts SDS has designed homes that are sensitive to the environment, 100% off the utility grid with clean energy building materials. All complex building sites are welcomed with their challenges and limitations whether it is site utilities, flood plain issues, grade limitations, zone and building code restrictions. SDS is located in Tucson, Arizona and has many out of state clients and projects from coast to coast. Out of region clients are typically surprised how easy communications and the various phases proceed with ease and understanding without sacrificing quality. Contact us today and together we can share ideas and develop design concepts that will exceed your expectations. We began our design practice with a clear focus and a commitment to a few closely held principles. We want to work with people who really care about what they do. Whether it is our clients or our team of design professionals, it is important that we all care about the work and its place in the lives of those who use it, the environment in which it participates, and the communities it serves. We want to work with people who are interested in great architecture and enjoy the art of discovery and problem solving. We delight in the joy of making. We delight in the poetic connections these artifacts can bring to our lives. Architecture is more than a business. Architecture is our contribution to you, to the planet and to the future. We would enjoy sharing with you the joy we see in solving problems and creatively finding better ways to dwell in the inspiring art of architecture. Luis Ibarra and Teresa Rosano (AIA, LEED AP) are native Tucsonans and graduates of the University of Arizona College of Architecture. In 1999, they founded Ibarra Rosano Design Architects. Two years later, Architecture Magazine published their first project and thrust them into the spotlight among an elite group of modern desert architects dubbed "The Arizona School". The youngest of those nine firms, Ibarra Rosano continued to maintain the attention of print and digital media where their work has been presented in more than 200 publications in over 20 countries. They are regularly invited to lecture on their work at national and international conferences. Their work has been exhibited in several galleries and museums of contemporary art. With more than 60 national and international design awards to date, their work continues to increase in international attention. In 2008 they were awarded Residential Architect's "Rising Star" for their body of work. Their work has served as the backdrop for various media campaigns as well as in the foreground on HGTV's "Extreme Homes". They have been three times-nominated for the prestigious Smithsonian Institute Cooper Hewitt National Design Award. Though their work is informed by their experiences in the deserts of the Southwest, their ideas appeal globally. Lee Shaw, principal designer of Lee Shaw Architecture, LLC, has nearly 30 years of experience creating beautiful spaces for people to enjoy and thrive in. His expertise is in blending historic qualities with modern technology and amenities to create an architecture that responds to its context and is timeless in style and composition. He approaches each project focusing on its unique requirements and characteristics. On all projects Lee plays lead roles in design, production and project management. Lee’s core strengths are providing creative solutions to challenging architectural projects and his ability to interact and communicate well with all parties involved to insure the highest quality and the most successful outcome. Lee is a team player whose responsibility is to service the clients needs and exceed their expectations. No project is too big or too small. We are nimble and flexible and can take a leading or supporting role. We love collaboration and working on a variety of project types and we seek out those with unique qualities and characteristics. Our skill is providing creative solutions to challenging problems. Our goals are to always please the client, meet their needs, exceed their expectations and to create beautiful architecture that never goes out of style. 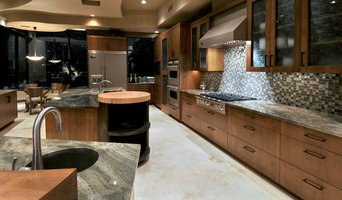 We provide custom residential and commercial design in the State of Arizona. Our design company specializes in residential architecture that imparts a sense of place and embodies the spirit of yourself and your site. We are known for fine hillside design and fitting a new building into a remote site or an urban context. Our building design is rooted in what's best for the arid southwest and our challenging desert environment. We call this regional southwest design. We seek sustainability by understanding the exactness of solar orientation and our climate characteristics. Some of the energy design tools we use include passive and active solar gain, passive cooling, radiant slab heating, thermal massing, daylight design, and highly insulated wall and roof systems. BEST OF HOUZZ 2017! Serving Southern Arizona, we are passionate about design and invite challenging projects. With over 30 years of business experience, we can handle your project, large or small, with professionalism and expedience. Repp + McLain Design and Construction is an award winning full service architecture and construction firm based in Tucson, Arizona. We specialize in residential and commercial desert appropriate, sustainable modern architecture. "An Alternative to the Typical..." Respect the land... build with sustainable materials, and create living environments with a neighborhood feel and sense of permanence. The architecture is a reflection of the rich and lush desert environments on which homesites are selected. A STELLAR GRAY FINE HOME is embraced by its natural surroundings. Art may triumph over function and every home offers lifestyle and sanctuary. Texture, color and character blend into a feeling for where we live. Solid and safe, yet nurturing from thickened earth walls and softened interior features. Stellar Gray Fine Homes has also developed an adobe hybrid technique whereby we use adobe and RASTRA and Adobe and/or Wood Frame incorporated to lower cost while maintaining the same character and integral colored plaster and features including wood finishes. In addition to the above, my son, Jameson Gray specializes in adobe home and homes of similar character. For those wanting to sell their James Gray Adobe Homes and/or Stellar Gray Fine Homes please contact Jameson Gray at 520.490.2404 and/or jameson@stellargray.com, Stellar Gray Real Estate Services, LLC. Full service Architectural, Engineering and Construction firm offering an award winning design/build delivery process of meaningful, relevant and respectful projects which incorporate a sustainable technologies focus on the essential foundations of your regional culture and landscape. I believe that thoughtful, place based architecture is transportable throughout a range of landscapes based on the architects ability to interpret environmental nuances which influence formal, architectural solutions. I have built my practice on this approach and relish the opportunity to respond to various canvasses. This is, in fact, the foundation of my work. Architecture evolves out of the site conditions as each site is unique. We believe in the integral relationship between site and structure and that sustainable design begins with the orientation of the building on the site. The site includes all factors that have a direct impact on the project. We analyze the topography, surrounding neighborhoods, city codes, client desires, sun angles and wind directions to create spatial experiences that allow people to connect with their environment. How do I find the best Tucson architect for my home design project? It is best to hire a home architect who will be involved in all phases of the design process, from the initial concept to the completed construction. The architect is often the first person you will hire for your project. If necessary, they might also help you select and hire Arizona subcontractors, which can include the builders, engineers and landscaper. Interior architects are also involved in negotiating contracts for all involved participants. It is for these reasons that it is extremely important for you to have a good relationship with the Tucson residential architect you hire. He or she can be the tie-breaking vote between you and the general contractor and can be your biggest advocate during the construction process. Different architecture firms in Tucson, AZ provide different services, so the scope of the work can span from pre-design environmental impact studies to selecting furniture and finishes, depending on what your specific needs are. It is very important to hire the right professional for the job. Remember that the most well-known or established designer might not provide the best architectural services for your needs. It all comes down to the individual project. Research and ask people whose work you like for recommendations. It's important to have somewhat of an idea of the style of house architecture that you prefer, as well as the amount you would like to spend. Residential architects in Tucson, AZ are natural problem solvers. They will assess the entire situation and help you to solve your problems too. Don't settle for a single company too early. Call and interview a few. Make sure that you feel like your personalities will mesh well and that you like their professional perspective. 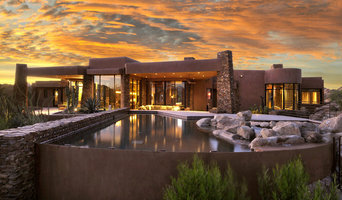 Find a home architect in Tucson, AZ on Houzz. Narrow your search in the Professionals section of the website to Tucson architects. You may also look through photos of Arizona projects to find interior architects and building designers who have worked on a project similar to yours.